January 2, 2018, WESTERLY – This spring, the entire length of the Pawcatuck River will once again be opened to the migration of native anadromous fish species, which have not been able to swim the river’s length since the 1880s. 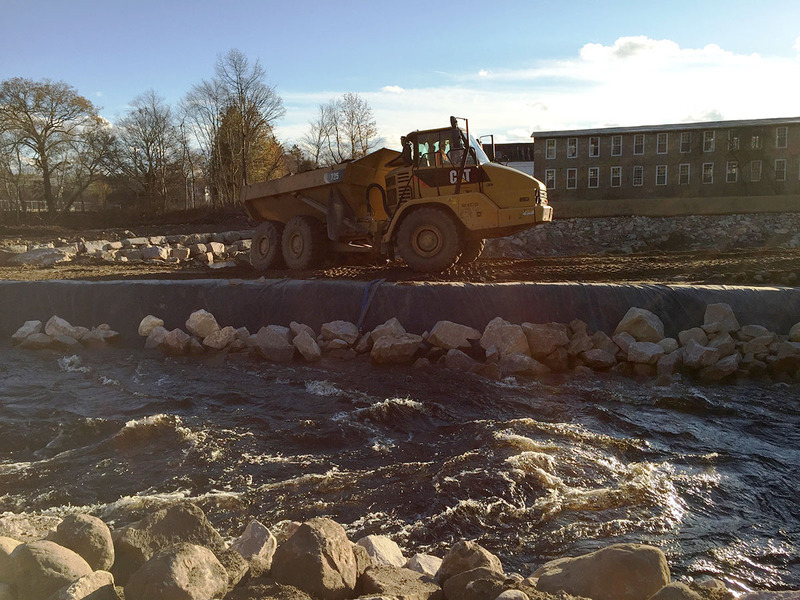 The final piece to a list of projects spanning decades and millions of dollars is the removal of the final dam on the Pawcatuck River, a six-foot-high timber and rock structure at the Bradford mill complex. Bradford dam was originally built in the 1880s for the Bradford Dyeing Association, which became Bradford Printing & Finishing in 2008. Work to remove the dam – listed as a high flood-hazard structure – began in June and was completed in fall of 2017, with the support of the company, according to Scott Comings, associate state director at The Nature Conservancy, which is leading the restoration efforts. TNC is one of the many organizations, including U.S. 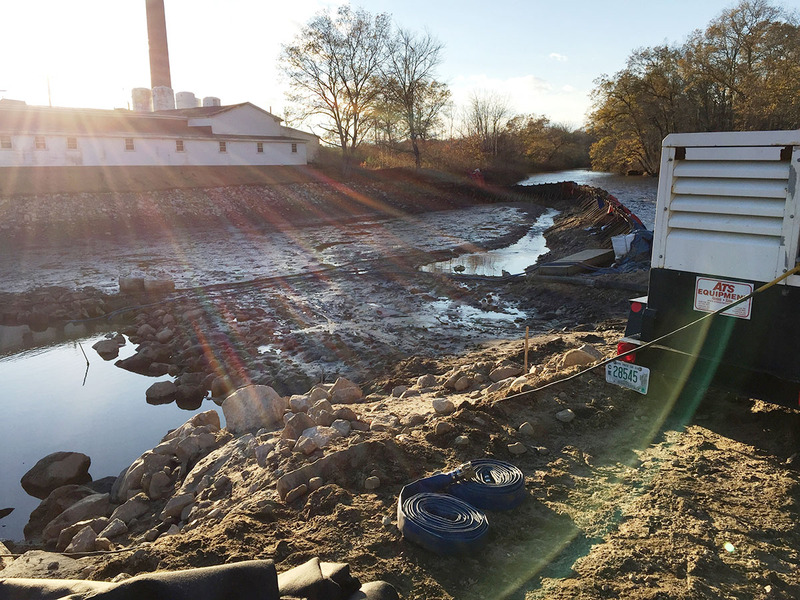 Fish & Wildlife Service, the Wood-Pawcatuck Watershed Association, the CRMC, R.I. Department of Environmental Management, and R.I. Foundation, that have worked toward the long-term goal of removing dams and constructing fishways on the river. These projects will restore nearly 1,300 acres of upstream spawning habitat that includes the state’s largest glacial freshwater pond, Worden Pond. Approximately half of the nearly $2 million project was funded by U.S. Department of the Interior funds awarded in the wake of Superstorm Sandy, and administered by the U.S. Fish and Wildlife Service. Rhode Island’s Coastal and Estuarine Habitat Restoration Trust Fund, managed and administered by the CRMC, provided matching funds over a span of eight years toward parts of this large project: most recently $70,000 to TNC in 2016. 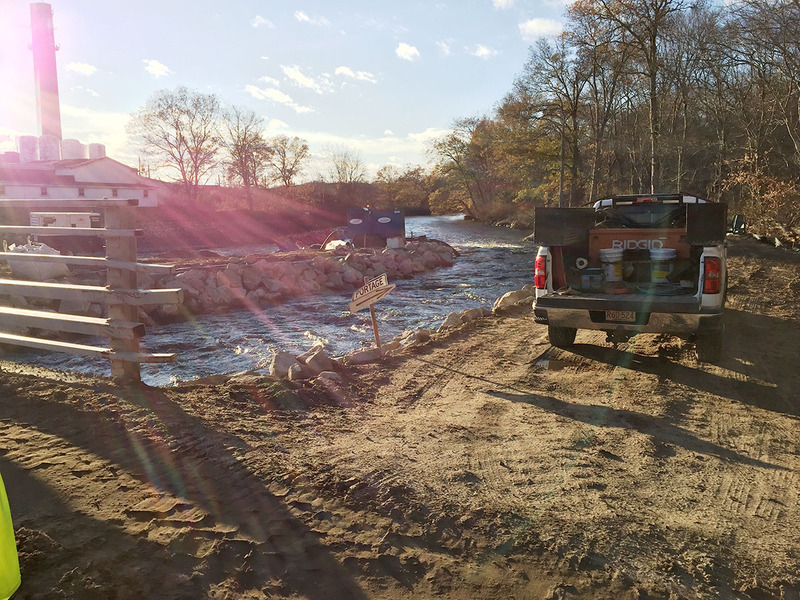 The CRMC also awarded funds in earlier years for associated projects on the Pawcatuck, including a federal stimulus award from NOAA in 2009 that provided over $2.8M for fish passage restoration projects at Lower Shannock Falls, Horseshoe Falls dam and Kenyon Mill dam. Coffer dams and a bypass channel were constructed to dry out the riverbed and divert the river’s flow approximately 15 feet from its previous location to allow for dam removal and work to begin on the riverbed. 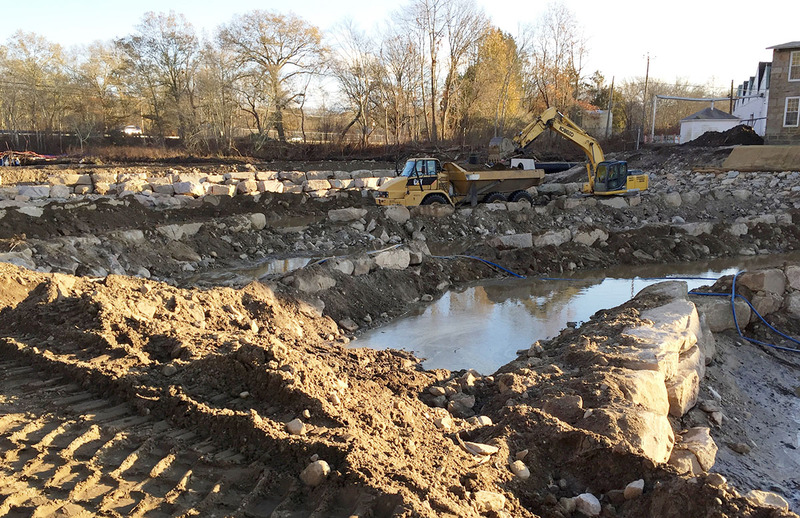 According to Comings, it took work crews all of an hour to knock out the old dam, and earlier dam pieces – some dating back to the 1780s-era logging mill that preceded Bradford, Comings said – were discovered by the crew. Eight raised stone weirs with a low-flow notch in the center were constructed on the riverbed with donated boulders to allow fish passage and for kayakers to easily paddle through during lower river levels. SumCo Eco-Contracting is finishing up site, back and bypass channel restoration, Comings said, and that work should be done by the end of January. Once the mill race is restored, crews will create a walking path where a wooded spill-over area exists, Comings said. The walking path along the river will allow kayakers to pull out prior to going over the weirs. New grading at the far bank will pitch flood waters toward the adjacent wetlands and spill-over area, instead of toward the mill complex. 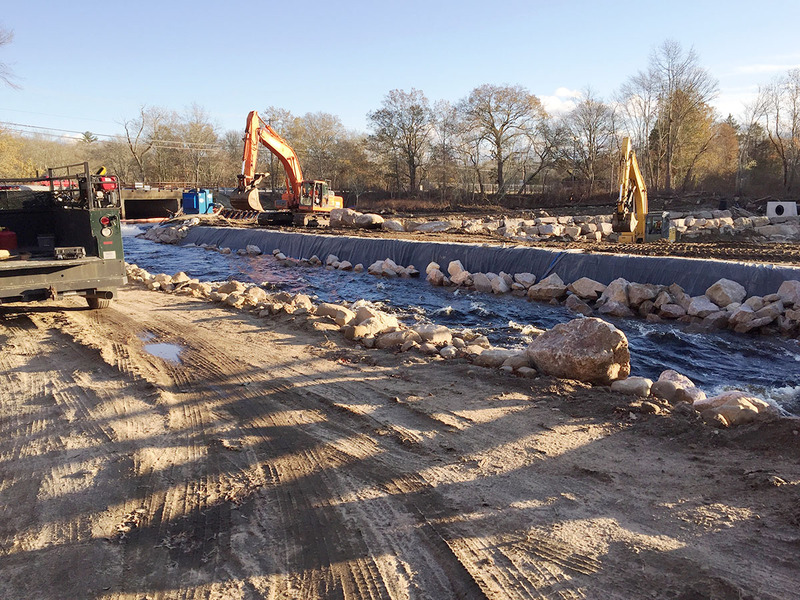 These projects open up passage to spawning and nursery habitat for a variety of important species, including Atlantic salmon, American shad, blueback herring, alewife, sea lamprey, American eel and brook trout.